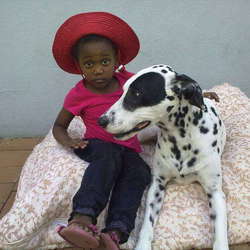 More recently, my new pup, Zuka Zama has joined me in producing the same result. Together, we coach the rest of the family pack to achieve this through love and always with FUN! 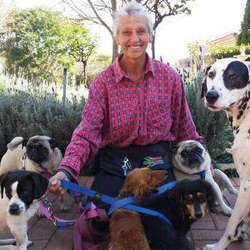 Zuka Zama means "don't be frightened dive in..."
If you or your family are terrified of dogs, let me and Zuka help you overcome this phobia. It will help you cope in your neighbourhood filled with dogs. 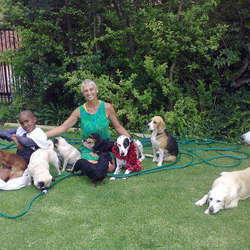 My trusted companion and partner dog- "Zuka Zama" and I will look after your dogs and your house while you are away. Call me to find out more. 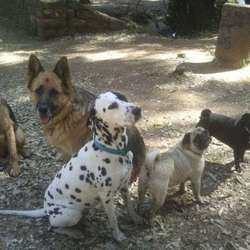 No matter who you are, your dogs age, we will help you to integrate your dog into your family, your life and your lifestyle. 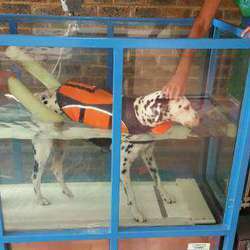 Aqua ( swimming pool) therapy and physiotherapy to help your injured, arthritic dog to heal. 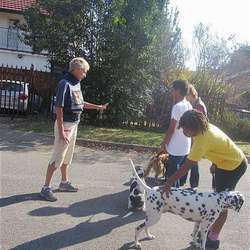 After an iniitial home visit, where you and I discuss family lifestyle needs effecting health and happiness of your canine family member, we collaborate in planning an exercise and training schedule introducing my partner, Zuka Zama ( means "don't be frightened,dive in") who role models desirable behaviour, calms and modifies undesirable behaviour and is affectionately dubbed Oom Kun by his children and learners alike. 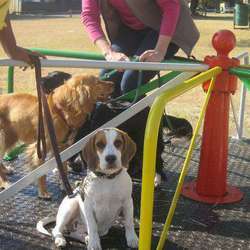 When your dog is happily listening to you, we move onto more challenges and interactions in many group situations such as: jumping, riding the merry go round, attending the shopping centre for coffee, going for walks in nature etc. Qualified as registered veterinary nursing sister in England with many years of experience of working with dogs as patients. 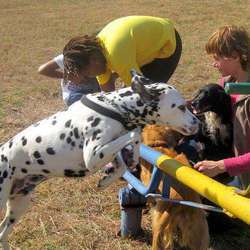 Qualified with a BA in Human Sciences at UNISA in 2013- passed with distinction- see photo with my fantastic Dalmation doggie at my side.